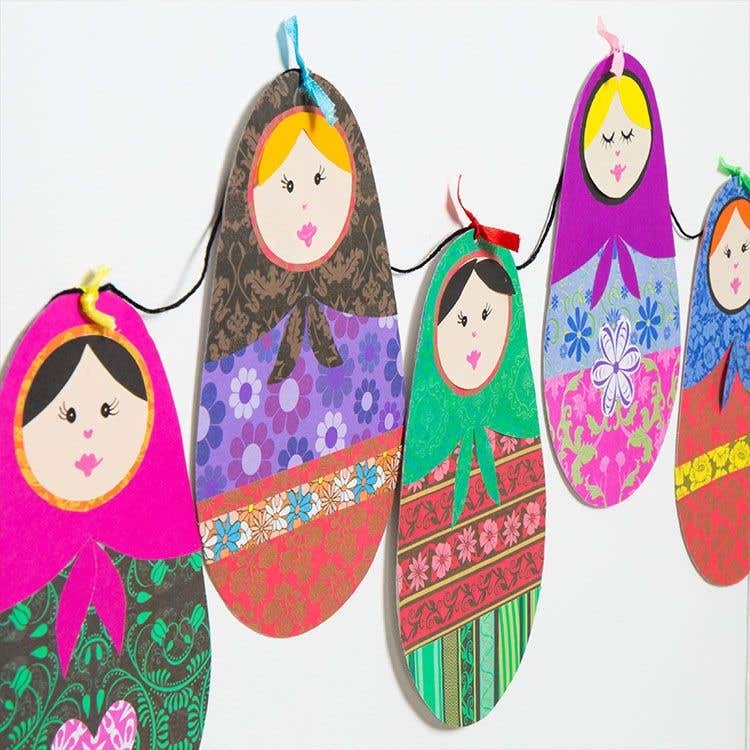 The Decorative Hues Paper Pack provides a huge selection of beautiful patterns to choose from for making these Russian Dolls. Fold an oval egg blank in half. Trim it down the side with scissors to narrow the shape. Open out the card so you have a symmetrical template shape for the dolls body. Draw around the template onto more egg blanks so there are enough shapes to make the bunting. Cut off the top section from the card template to make a curved shape for the headscarf. 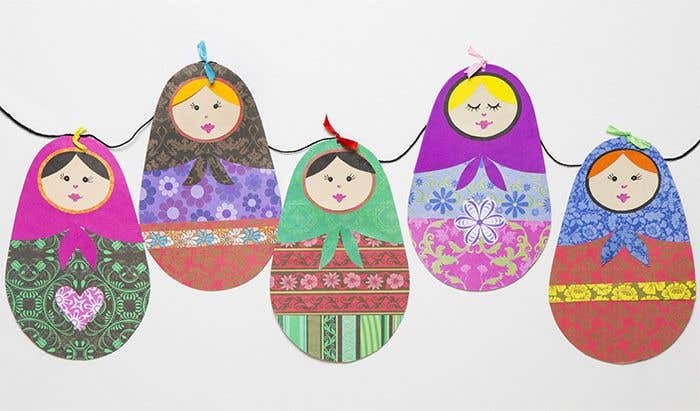 Use this piece as a guide for cutting out a paper shape, then glue it onto the doll. Choose a contrasting pattern or a plain colour, so the scarf stands out against the body. Add small matching pieces where the scarf ties in the middle. Glue patterned strips onto the doll. You could add a simple cut out shape like a heart or flower. Cut out an oval for the dolls face. Glue the face onto another colour and trim around the edge leaving a border (aprox 5mm) to help the face stand out against the background. Add cut out pieces for the hair. Draw eyes, nose and a mouth using felt tip pens. Use a fine black pen for the eyelashes. Decorate the remaining card shapes in the same way. 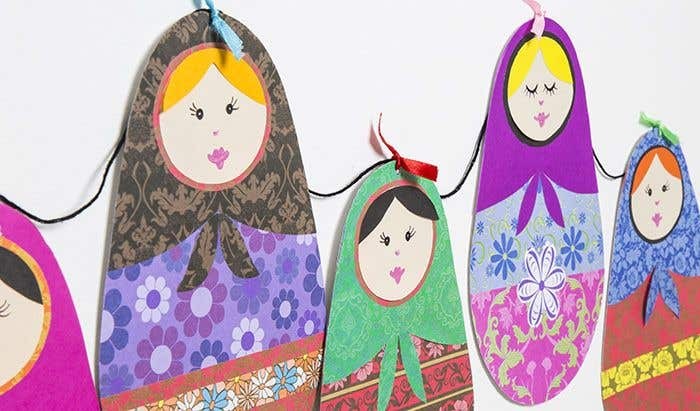 Use a variety of patterned and plain papers, so each doll is different. Punch a small hole near the top of the dolls then thread each one with ribbon (ribbon - comes with the egg blanks ) and tie onto a long piece of thread to hang up. 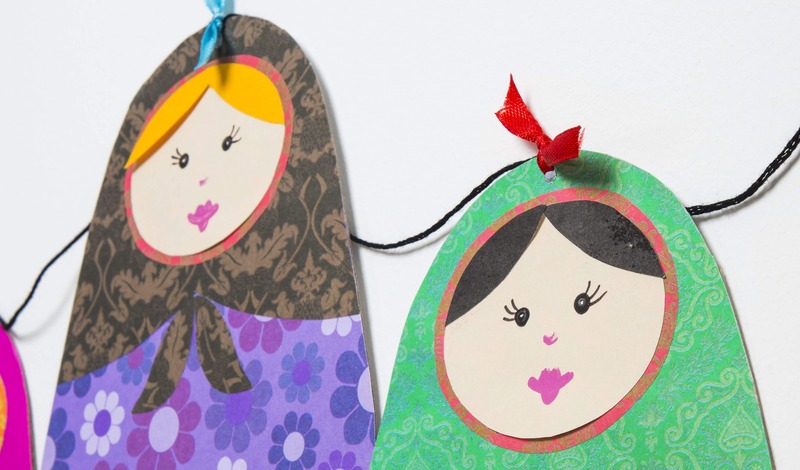 Try making smaller-sized versions of these dolls for adding to cards and gift tags!